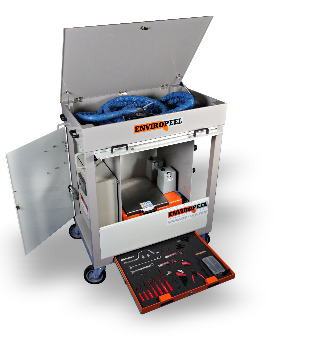 The Enviropeel System is a corrosion-inhibiting sprayable thermoplastic barrier coating system, comprising the Enviropeel material and a range of specially-designed computer-controlled application units. reveal the protected surface. Removed material can be returned to the unit for re-application. 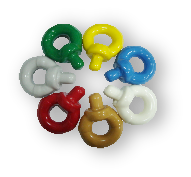 The material is a sprayable thermoplastic containing inhibitors for active corrosion protection. It protects against galvanic, pitting and atmospheric corrosion. Prevents water, dust, and contaminant ingress and isolates vulnerable components from corrosive environments. The material is supplied grey as standard but can be made any colour to order. 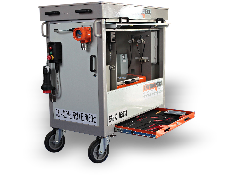 Right: The 5kg unit is designed to break down into separate easily portable units. Capacities from 5kg to 30kg are available with EX and gas detector-equipped, DNV-rated Zone 2 variants for use in hazardous areas. 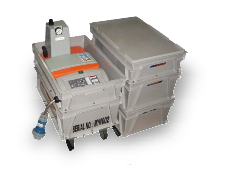 A portable ‘Slugger 170’ unit has also been introduced for repairs and small applications. Left: This 30kg CA30 Base Unit has twin pumps and can be fitted with two hoses of 10 or 19 metres. Both 30 and 18kg units can be supplied as Zone 2 or standard base units. All Alocit material copyright © Alocit International Limited 2009 - 2018.